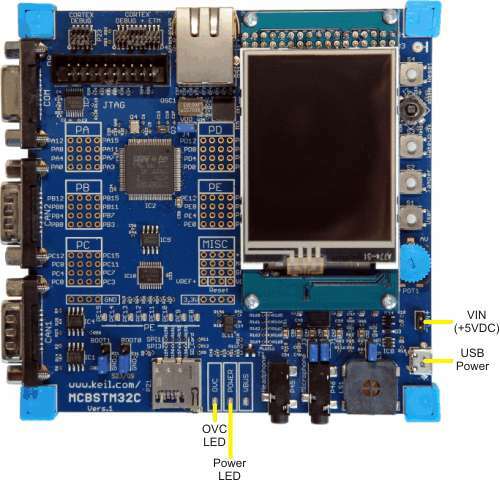 USB: the board is supplied automatically with 5 V when connected to a PC through a USB A to Micro B cable. The STM32 microcontroller can use the USB interface as a USB device. VIN: when connected through a VIN connector, a voltage between 5.0–5.5 VDC must be used. A voltage of 5.5 VDC is necessary when the USB interface is used as USB host or as USB OTG. In these cases, the USB interface can supply other USB devices with 5 VDC. The STMicroelectronics STMPS2141 power-switch at IC14 protects the USB power interface from overcurrent. The voltage regulators IC3 and IC12 generate 3.3 Volts DC, the IC13 generates 2,5 Volts DC to supply all components on the board. The POWER LED indicates that +5 Volts DC are present on the board. The OVC LED illuminates when the USB interface is configured as host and an overcurrent occurs.